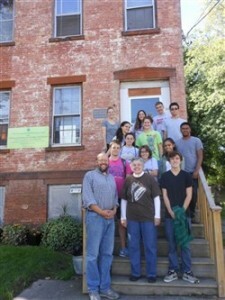 Saint Rose offers a variety of service-learning courses, which link academic theory with real-life experiences. Saint Rose faculty partner with local community organizations to provide service opportunities connected with course learning objectives. This teaching method results in a broader and deeper understanding of course content. By responding to community needs, students foster a sense of civic engagement and view the “classroom” as extending beyond the Saint Rose campus. As an engaged urban campus, Saint Rose has developed special relationships with community partners, who are co-educators in our service-learning courses. Thanks to these partnerships, Saint Rose students have opportunities to learn and volunteer with programs that address housing, environmentalism, hunger, immigration, education, voting rights, literacy, etc. The College of Saint Rose is an engaged urban campus. Located in the city of Albany, Saint Rose has mutually beneficial partnerships with community organizations throughout the Capital Region. These special relationships provide students, faculty, and staff with opportunities for the sharing of knowledge and resources, assisting with the development of community organizations, and exploring creative ways to improve the social and economic conditions of our larger community. Our engagement with the urban environment expands the setting for educational opportunities and encourages the Saint Rose community’s energetic involvement and effective leadership in society. Through community service, service-learning courses, internships, field placements and a community advisory board, Saint Rose explores creative ways to engage our local, national, and global community. First-year students in the American City Program are enrolled in the Community Involvement (CIN 100) course. This interdisciplinary, service-learning course provides students with an opportunity to volunteer with off-campus community organizations and reflect on their experiences. During class meetings, students discuss how dynamics of race/ethnicity, gender and socio-economic class are observed in their volunteer site visits. Students write about how social inequalities are being addressed in urban communities. Through writing assignments and in-class group activities, students identify how learning objectives from other American City courses relate to CIN 100 reading assignments and volunteer experiences. CIN 100 students used concepts they learn in Political Science, English, History, Sociology, and Philosophy courses to reflect on their volunteer experiences at a soup kitchen, food pantry, refugee center, inner-city ecological center, domestic violence program, neighborhood centers, and a building project to assist low-income families. One group of CIN 100 students, enrolled in a Political Science course, assisted a local community partner by promoting voter registration in a low-income neighborhood. This experience provided students a deeper understanding of engaged citizenship while assisting a local civic organization. Community partners are located in a variety of neighborhoods throughout the city of Albany.